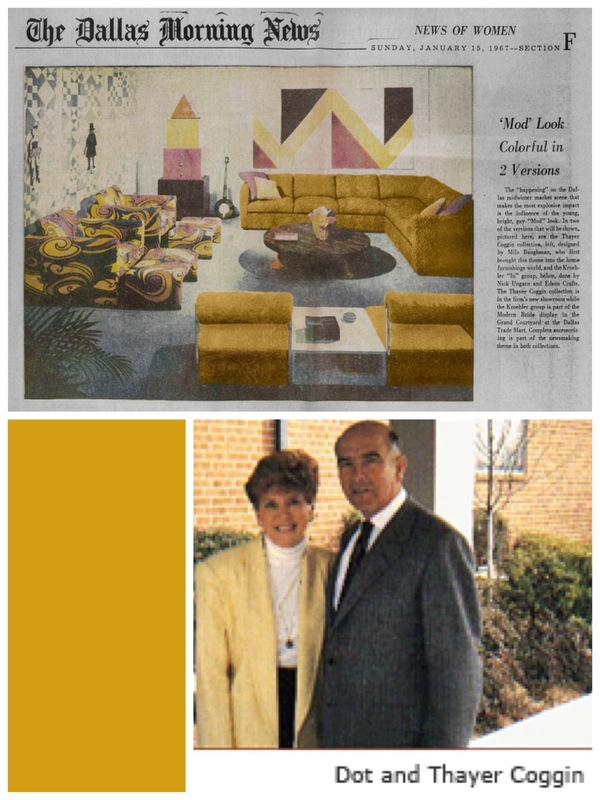 Thayer Coggin, the family owned furniture company based in North Carolina, is celebrating its 60th anniversary this year. Thayer Coggin was the man behind the brand that was one of the first manufacturers of modern furniture in the U.S.A. A U.S. Army medic in World War II, Coggin founded Thayer Coggin in 1953 and saw a shared vision upon meeting Milo Baughman, a young designer from California. Thayer Coggin furniture was sought after long before it became vintage by celebrities, including Frank Sinatra and Robert Redford. The company even made matching pink leather recliners for Elvis Presley. “The year was 1953. A meeting took place between two gentlemen that is now recognized as marking an important inflection point in the history of the American furniture industry. The unique and creative design genius of one, combined with the inventive engineering and manufacturing expertise of the other, manifested into the formation of Thayer Coggin, Inc.
THAYER COGGIN was born in 1922 and raised in Denton, North Carolina. In 1934 during the midst of the depression, his father moved the family 25 miles north to High Point, NC, seeking better opportunities for his lumber business. Thayer’s love of furniture began on an early Christmas, when all he asked for was for a claw hammer. After receiving it, Thayer proceeded to make his own bedroom suite. A few years later while in shop class at High Point High School, he made rocking chairs and cedar chests for tuition money to attend High Point College (now High Point University). By the end of his freshman year, Thayer felt compelled to join the U.S. Army and served four years primarily as a medic in North Africa. Family owned and run, Thayer Coggin has 350,000 square feet of manufacturing space to produce some of the most recognizable furniture designs on the market. His wife Dot, daughter, sons, and even grandchildren, are all making sure that Thayer’s commitment to beautifully designed and engineered custom furniture remains firmly intact. If you are in the Austin area be sure to check out Thayer Coggin’s travelling roadshow to celebrate their 60th Anniversary. The event is Thursday, June 27 from 5pm to 9 pm. NESTModern is located at 1009 W. 6th St, at the corner of 6th and Baylor. For more details visit their facebook page athttp://www.facebook.com/nest.modern.